One of the most “Instagrammed” places of recent times; and I have got that bucketlist item ticked off the list as well! Ever since having seen photos of the Horseshoe Bend for the first time I wanted to experience this unique landscape with my own eyes – and get one of those “unique” panoramic shots. Interestingly, it’s only a relatively new phenomenon that the Horseshoe Bend is so popular, which has seen annual visitor numbers rising up to 1.3 million! Hordes of people armed with selfie stick and mobile phone is a common sight these days; locals tell the story of a a place kept a hidden treasure for most of its existence. Just a few miles outside of Page, Arizona, a short trail winds its way up to the spectacular edges of the Canyon walls – it’s easy to see why this has become such a popular attraction. Ultimately, this is the reason why I found my way there too! Thankfully it’s off-season. Yes, this was certainly the most crowded place I’ve been to during my trip through Arizona. But I expected worse. And experienced much, much worse in other parts of the world. 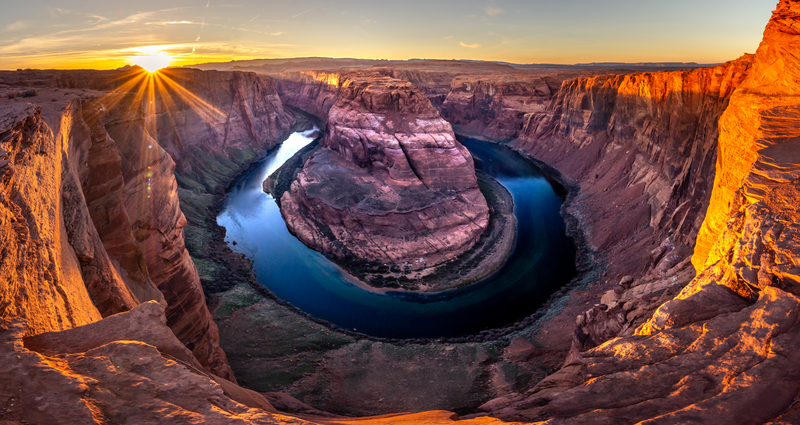 Despite sunset time, the most popular time of the day for the Horseshoe Bend, there was ample opportunity to wander left or right and leave the crowds behind to find a place for oneself, to take in the breathtaking scenery and enjoy the sun slowly fading away. Nonetheless, the crowds become an issue. At other times, there’s no serenity here, and in order to accommodate the masses changes are coming to the Horseshoe bend: “proper infrastructure” is currently under construction: meaning a new trail, railings as well as the rumours have it, a $25 entrance fee. That’ll alter the uniqueness of the experience dramatically, of course. What choice have authorities, though? They’ve got to ensure safety and currently, that has to be said, it’s rather dangerous, given there are no barriers, and beyond the edges it goes 300 metres straight down! For the photo I had in mind, a straightforward panorama, I brought the Sigma 8-16mm. Finding a place for myself wasn’t an issue…. but one that provided the perspective I had in mind, while having a panoramic images with no people tangling their legs over the edges was the difficulty. I decided to wander to the left and “hid” behind a tall stone wall, that helped to frame the picture but also hid the people I didn’t want to have in the shot. Eight vertical frames were stitched together in post in Lightroom eventually.